Hi all, just a few pics of some recently stripped and polished safe plaques. The cast iron Cotterill plaque was a nice surprise when it came in the post, I didn't even know they were made in iron, or the smaller size (11.5cms). I do realise that my enthusiasm for safe plaques can probably be a bit boring so I'll leave it to the pics.... have a good Easter. Hi warren, you certainly get some nice keys and safe plates- love the cast iron Cotterill it's nice to have a bit of a contrast on the odd one and you've done a nice job of cleaning them all up. Safe plates are one of the few antique metalwares which nearly always seem to look better when cleaned, although I wouldn't want the job of keeping hundreds of them like it! The round Chubb looks a beauty as well- the central detail looks exceptionally fine and intricate compared to most. BTW Don't apologise for your enthusiasm, we need more members like you who are prepared to post their collections and join in from time to time, so the more enthusiasm the better !! ps, thanks for your kind comments on the model door over in the other thread, I won't reply to it there as its not fair for me to bump it back up to #1 spot, but your comments are much appreciated and if ever you're down this way you must call in to say hello and see them. I lost my collection in a divorce and never had the heart to start again. Coincidentally, the exact copy of that Guard plate, I won a few minutes ago on ebay. Something that really used to annoy me, but actually scored me some good name plates, was how some installers used to mount alarms. In the dim and distant days before passive IR safe alarms were bolted to the door. To save the time and trouble of drilling and tapping 2 mounting holes for the alarmed escutcheon unit many installers would remove the plaque and use one of the holes as a mounting for the alarm unit. Of course it meant that there was a second hole left on the door, but they didn't care, nor did most owners. I thought it was a travesty. 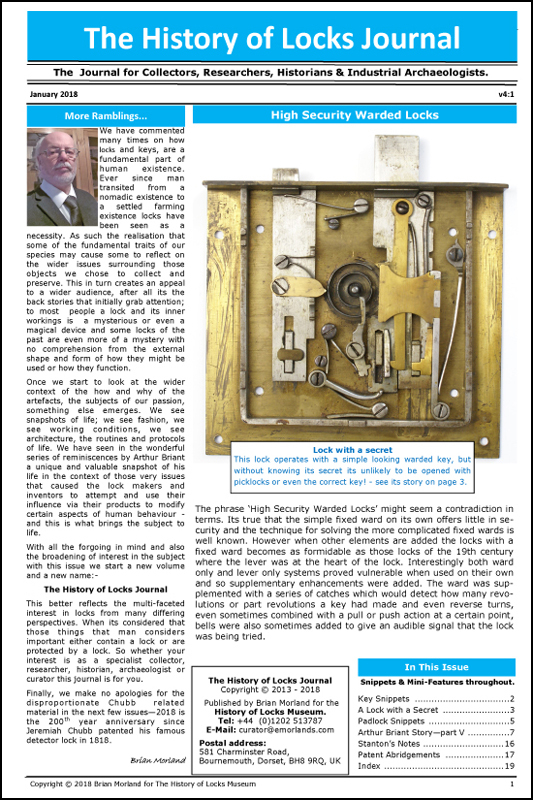 Tom, who made the early Guard safes fitted with those brass plates then as we used to see quite a few of a modern 1980's safe branded Guard but can't remember ever seeing an oldie fitted with those. And I scored an escutcheon at the same time. You are right as ever. I had never seen this manufacturer before and, given my collection's size, I was delighted to add this plate to it.... but then a few days later it stopped being unique!! it can't be the same company, but who knows?? ?